Delicious crab apple jelly, shimmeringly pale pink, reminds me of my childhood. One of my abiding childhood memories is of my mother making jams, jellies and other preserves. I particularly remember jelly making, like crab apple jelly; the jelly bag full of cooked fruit hanging from on an upturned stool on the kitchen worktop with the juice first running through in a steady steam, and then the drips getting slower and slower and eventually stopping as the mixture strained, and watching that last tantalizing drop that resisted gravity and clung to the bottom of the bag. My mother would tell me “NOT to poke the jelly bag” as that would lead to cloudy jelly; as mother, as daughter: the cry “Do NOT poke the jelly bag” has now been uttered from my lips to visitors to my kitchen who have looked as if they might be getting a little too close to it for my comfort. Jelly is so easy to make, minimal chopping and no time consuming peeling, coring or stoning, so it appeals to my fuss free cooking preferences. 10 years ago I did rather a lot of preserving, after a busy week at work I found going to the market at the weekend, buying fruit or vegetables to make jam, jelly or chutney, coming home and making 12 or so jars. All my friends knew about this passion for preserves and saved me all their empty jars, each delivery of a bag of jars was swapped for a jar, or two of homemade preserve. Of course what ended up happening was that even with giving most of it away I was still making more than we’d ever manage to eat, and aside from two batches of marmalade there has pretty much been a ban of preserving in my kitchen for the last 10 years. Oddly it all run out at the same time, so I’m preserving again, but embracing the mantra of making small batches and experimenting with flavours and recipes. The original recipe for this says use at least 4lb of crab apples or it is not worth the bother – how times have changed – small batch is more fun people! Crab or wild apples are small tart fruit, trees literally dripping with crab apples are often found in gardens as they look attractive, all too often the fruit are left picked and fall and are left to rot under the tree. Crab apple jelly is a beautiful salmon pink colour which I greatly enjoy having in the store cupboard; it goes well with pork in place of apple sauce and is equally delicious on toast or bread. Crab apples are also full of pectin (which makes the jelly set) and are thus ideal for the first time jelly maker. If you run out of time then freeze the juice before turning it into jelly. Or cover and leave in the fridge for a few days. With high pectin fruit like crab apples you can add half the amount of the original water and reboil to make another batch. I simply don’t bother anymore as I end up with far too much preserve. Don’t waste the pulp – pass it through a food mill to remove the pips, stalks and skins. Use in cakes, bakes, add a little to porridge or cereal. It should freeze well. If you try this Crab Apple Jelly please tag #FussFreeFlavours on Instagram or Twitter. It is amazing for me when for me when you make one of my recipes and I really do love to see them. You can also share it on my Facebook page. Please pin this recipe to Pinterest too! Thanks for reading Fuss Free Flavours! Delicious crab apple jelly is perfect for the beginner preserver. Traditionally served with pork, but equally good on toast. Simply slice the crab apples in half and place in a large pan, add water to cover ¾ of the fruit and gently simmer for about 40 mins until all the fruit has turned to a pulp. 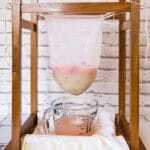 Meanwhile, hang a jelly bag from an upturned chair or stool and place a large bowl underneath – if you do not have a jelly bag loosely attach a muslin cloth to the legs of the stool using elastic bands. 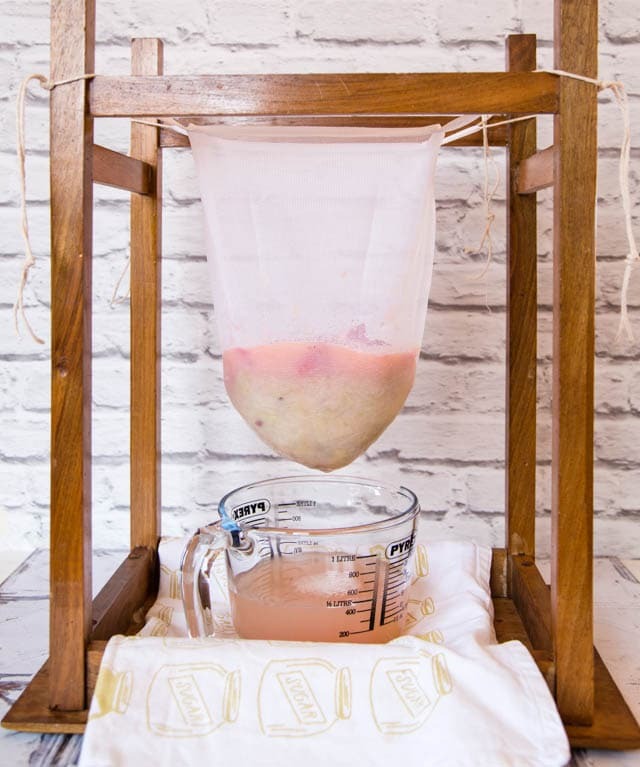 Using a jug pour the pulp into the bag of cloth and leave to strain for 12 hours, do not poke, prod or push the pulp to speed the straining as it will make the finished jelly cloudy. When strained measure the juice – add l lb sugar to every pint of juice (this is almost exactly an equal weight of sugar to juice – I put my preserving pan on the scales – weigh the juice and then add an equal weight of sugar. Gently simmer the syrup until it starts to thicken. As it simmers, stir to dissolve the sugar. Foam and scum will rise to the surface, skim them off with a slotted spoon – I keep a large bowl of cold water next to the hob to rinse the spoon off in. This clarifies the jelly – the cloudy juice becomes a pretty clear jelly. Meanwhile put your jam jars the oven on GM 1 to warm and sterilise and put the lids into a bowl and pour boiling water over. As the jelly reduces it will reach setting point, from bitter experience it is very very easy to get this wrong – under cooked jelly can be boiled up again – over cooked jelly will set too firmly. Setting point is reached at 105C/220F on the sugar thermometer – if you do not have a sugar thermometer drop a little jelly onto a chilled plate and when ready after a minute it will start to set and the surface will wrinkle if you prod it. Once setting point is reached remove jelly from the heat and take jars from the oven and remove lids from the hot water. Give the jelly one last skim to remove the foam and scum. After a few minutes pour the jelly into the jars, quickly skim each jar using a tea spoon and seal down with the dry lids whilst still hot. Immediately make tea and toast and enjoy your first taste of home made jelly from that last jar that is only partially full – there is no real point in sealing and saving this one and after all you deserve to taste the results of your hard work straight away! As the jars cool each lid will pop and be sucked in to make the seal – I always find this most satisfying to hear as I enjoy my tea and first taste.